Originally released in October 2003, Ember to Inferno was the debut album from American metal band Trivium. 13 years later, Trivium are a household name and that album has now been re-released. Trivium have managed to push out 6 more albums since their debut, which is a very decent return, but it was really their second album that thrust them from being a promising young band into the glare of the spotlight. That album, Ascendancy, was very well received and even won the band the Kerrang awards for best album and best new band. With so many eyes on the band, their follow up, The Crusade, sold well but wasn’t so well received by the fans with Trivium drastically changing their style and dropping all the metal growls and shouts. They brought that style back again, mixed with clean vocals on their next two albums, Shogun and In Waves. Both of these albums are really very good though weren’t welcomed as much as they should be by the fans. The problem the band were having by now was that their indecision around styles was creating as many haters as fans and the band needed to settle on something. 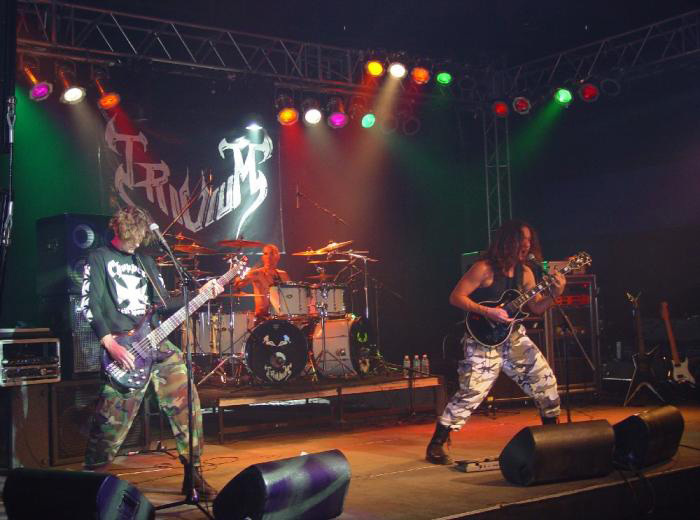 Many fans of Ascendancy left the band after The Crusasde so didn’t listen to Shogun which was a return to form whereas new fans created by The Crusade were suddenly pushed aside again. This continues on to this day unfortunately with Vengeance Falls, a pretty heavy album, being followed by their most recent release, the clean vocals only Silence in the Snow, an album I didn’t enjoy much at all as you can read here. So, the band that were destined to be the next Metallica apparently have never really fulfilled their potential but they are still young and who knows what the future brings. For now though, let’s look at the past and where it all started. 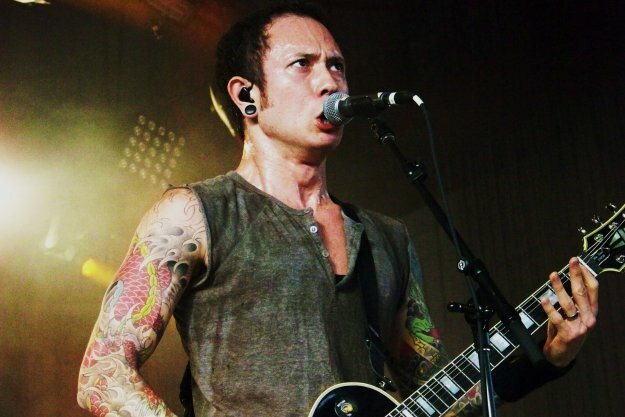 Before I delve into the album musically, let’s just take a second to mention Matt Heafy’s vocals. The man is obviously a talented guitarist and I was interested to read that he actually got offered the job in Trivium as a lead guitarist, not as a singer. Then singer, Brad Lewter, left the band before recording this album and Matt covered both lead guitars and vocals to get the album out. It obviously did okay as an album so I guess he just chose to carry on but even the most die hard of Trivium fan would be lying if they said that he has a strong voice. He doesn’t. Clean singing works okay for him but his metal shouts lack strength. In some songs it works okay as it can be carried by the guitars, bass and drums but at others, it can really sound nasally and grate on you a bit. Ember to Inferno was released on Life Force Records and is just under 49 minutes long with 12 tracks on it. It is bookmarked on each end with short instrumentals acting as the intro and outro to the album and a third sitting in the middle of the album so really you are getting 9 full songs. The first of these, Inception: The Bleeding Skies is just 30 seconds long and never really gets anywhere whereas the last one, A View of Burning Empires is almost 2 minutes long and is quite a nice acoustic melody for a while but it drags on a fair bit considering it is the same few notes played on repeat with some background effects. The middle one, Ashes, is more of an irritant than a bit of music and should have been dropped. I find these to be quite representative of the album as a whole really. Unimaginative at times and sometimes feels like it drags on a bit. It isn’t all bad though. There are moments I like and there are a couple songs which I enjoy wholly. The title track, Ember to Inferno, is a great song with a solid riff and strong drumming. You can definitely here Ascendancy on this song, more so than on any others. It has a memorable chorus, which switches the rhythm up infectiously from the blazingly fast verses, and a very decent guitar solo near the end too. I also quite like the song Requiem which has one of my favourite riffs on the album played throughout. It also has a really catchy prechorus and chorus and a heavy sounding instrumental section that leads into a decent solo. As the solo ends, the song picks up the pace and aggression with some real thrash metal sounds and some impressive drumming from then drummer Travis Smith. Unfortunately in terms of songs I like a lot, that is it. Despite multiple listens, nothing else stood out as what I would class as a very good metal song. There were plenty of good moments within songs but it never translated to a complete track and the main reason for that is the vocals. See Trivium today, or from Ascendancy, can get away with vocal wobbles a bit because of the production on the album and the other instruments that would fill gaps but this album is obviously of a more amateur sound. If you consider that and the fact that Matt is young and trying to cover lead guitars and vocals, while not being a vocalist, well the problem is obvious. With production being the way it is here, Matt’s vocals are at the forefront and they just don’t sound that great. He isn’t alone though as musically there are issues too. The drumming can be bland as can the bass and the lead guitar, also being played by Matt, sounds like it suffers from Matt focusing on singing. So many tracks sound forced and amateurish and I guess that is exactly what they were back then. Songs like My Hatred, which starts off with a pretty good intro, descends into bland and drab very quickly with Matt sounding like he is holding his nose during the singing sections, clean or otherwise. When all Light Dies and Fugue (A Revelation) both also start with a little promise but also fall into the routine of being unimaginative, predictable and quite difficult to listen to in some of the vocal moments. Pillars of Serpents is one of the heaviest tracks Trivium have ever put together and, though there are moments where they drag out the bridges too long, it does have a sense of something epic about it and some decent guitar work. His vocals near the end don’t sound great though. If I Could Collapse the Masses has the same problem with great drumming and riffing at the intro but a single clean sung line at the end of each verse which sounds horrid but not nearly as bad as the singing at the end of the song. I think you have to take step back and appreciate that this is a 3 piece band and 3 kids at that. They were then and still are, immensely talented and have gone on to do great things, well mostly. They have obviously learned a lot on that journey and it is quite nice to glimpse into the past and see them before they knew any of it but be under no illusions, this is them before they knew anything. 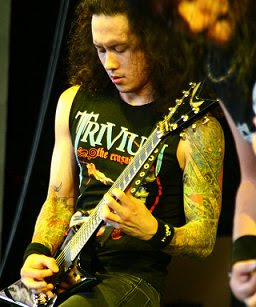 This is Trivium, and metal, on an amateur level. Poorly produced, loads of dodgy sounding vocals, sometimes boring riffs but also a little glimmer of potential with songs like Ember to Inferno and moments within songs like the heaviness of Pillars of Serpents and the intro to If I Could Collapse the Masses. A couple decent tracks that are definitely worth checking out if you never have and if you don’t like Trivium, well this sounds nothing like the Trivium you know from today so maybe you will like it? Other than that, this is one for the fans really. If you are a fan, you have probably already heard this album anyway but if you haven’t, then go check it out and see where your band came from.